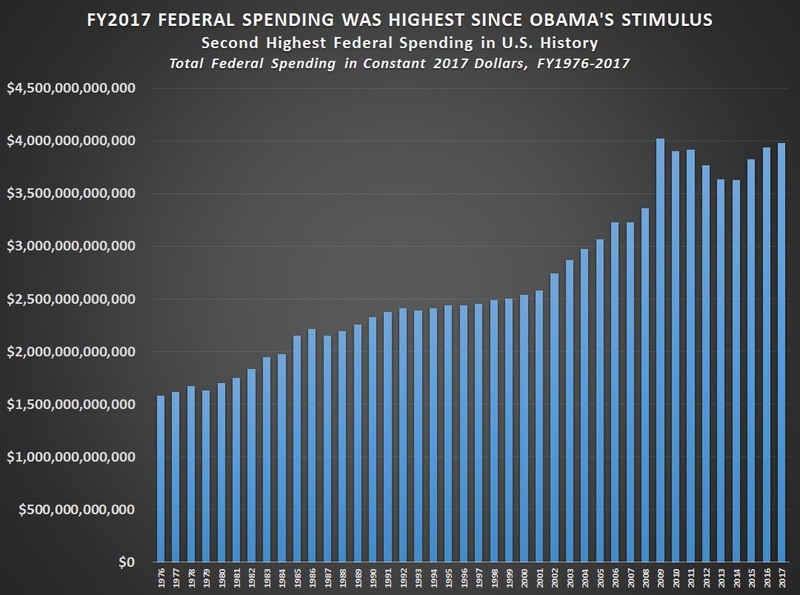 (CNSNews.com) - Real federal spending in fiscal 2017, which ended on Sept. 30, was higher than in any year in the history of the United States other than fiscal 2009, which was the year that President Barack Obama’s $840 billion stimulus law was enacted. Fiscal 2017 also saw the second highest real federal individual income tax totals of any year in U.S. history, according to the Monthly Treasury Statement released today. Total federal tax revenues were the third highest in U.S. history. 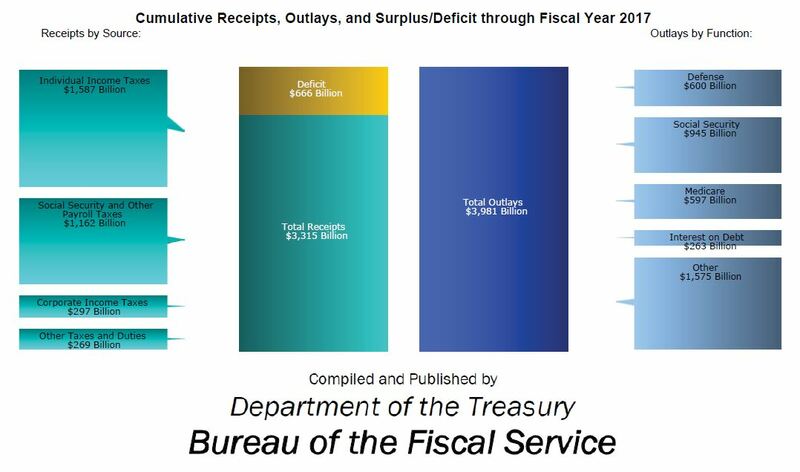 While it was collecting the third highest total tax revenues in U.S. history, the federal government ran a deficit $665,712,000,000 because of its high total spending. Republicans have controlled the House of Representatives since 2011, after winning a majority of seats in the 2010 election. They have controlled the Senate since 2015, after winning a majority in the 2014 election. In fiscal years 2016 and 2017, a Congress in which the Republican Party controls both houses was responsible for enacting all federal spending legislation. Total federal spending in fiscal 2017, according to the Treasury, was $3,980,605,000,000. Total federal tax revenue was $3,314,893,000,000. Prior to this year, the highest level of real federal spending was the $4,024,794,600,000 in constant 2017 dollars (adjusted using the Bureau of Labor Statistics inflation calculator) that the Treasury spent in fiscal 2009. In the years after 2009, real federal spending hit its lowest level ($3,633,572,490,000 in constant 2017 dollars) in fiscal 2014. In fiscal years 2015, 2016, and 2017 federal spending has been on the rise again—reaching $3,980,605,000,000 this year, the second highest spending level in the nation’s history. 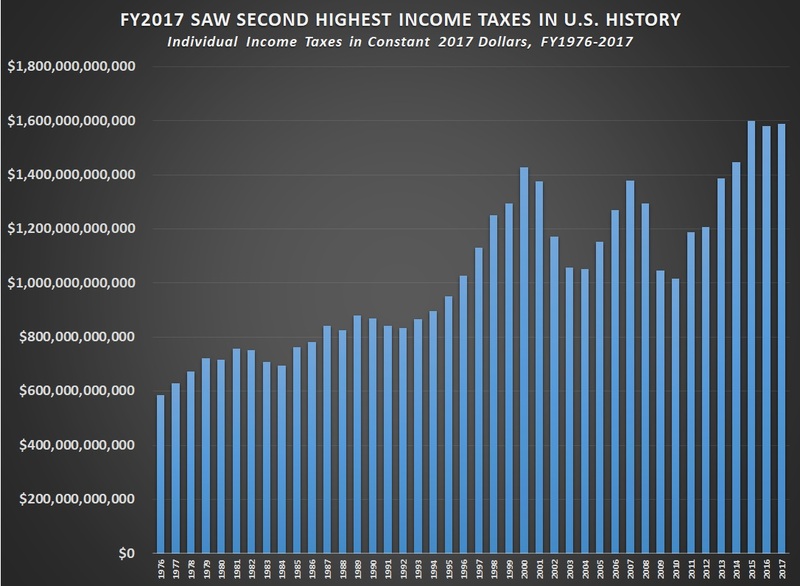 On the tax side, federal individual income taxes hit their all-time peak in fiscal 2015, when the Treasury took in $1,598,265,180,000 in constant 2017 dollars in individual income taxes. In fiscal 2016, individual income tax collections dropped to $1,580,598,300,000 in 2017 dollars. Then, in fiscal 2017, individual income tax collections climbed back up to $1,587,119,000,000, the second largest sum in individual income taxes the federal government has ever collected. Total federal tax revenue also peaked in 2015 at $3,369,881,960,000 in 2017 dollars. It then dropped to $3,339,631,960,000 in fiscal 2016, and dropped again to $3,314,894,000,000 in fiscal 2017. According to a study by the Congressional Budget Office, the largest budgetary impact of President Obama’s 2009 stimulus law hit in fiscal 2010, which began on Oct. 1, 2009. The three first fiscal years under the law--2009, 2010, 2011--saw the biggest spending increases from it. “By CBO’s estimate, close to half the impact occurred in fiscal 2010, and more than 95 percent of ARRA’s budgetary impact was realized by the end of December 2014," said the CBO study. According to the CBO, Obama’s stimulus increased federal spending by $114 billion in fiscal 2009, $235 billion in fiscal 2010, and $147 billion in fiscal 2011. In fiscal 2012, the spending increase caused by the stimulus dropped to $59 billion. The CBO estimates that in the four fiscal years from 2016 through 2019, the Obama stimulus will only add a total of $28 billion to federal spending.